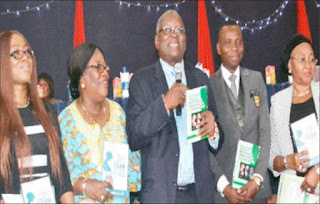 L-R: Dr. Esther Ohihoin, wife to the author; Hon. Justice Funmilayo Atilade; Emeritus Prof. Osato Giwa-Osagie;, Dr Aigbe Gregory Ohihoin of NIMR, author; and Hon. Justice Y.O Idowu during the book launch. To curb the high rate of infant and maternal mortality in the country, researchers, mainly eminent obstetricians and gynaecologists weekend, canvassed for increased attendance in antenatal care classes by pregnant women. The call was made by the experts at the formal presentation of the four books written by Aigbe Gregory Ohihoin, a Chief Research Fellow, Nigerian Institute of Medical Research (NIMR) Yaba, Lagos. They described the country’s high infant and maternal mortality rate as unacceptable and blamed the ugly trend on myths and misconceptions, saying this prevent women from seeking care during pregnancy, until complications set in. The experts strongly believe that the presentation of the four books was a timely one and would be helpful in tackling the high infant and maternal mortality rate in the country. Prof. Osato Giwa-Osagie, Emeritus Professor of Obstetrics and Gynaecology at the College of Medicine, University of Lagos corroborated earlier views. Giwa-Osagie observed that one of the factors responsible for infants and maternal mortality is old wives tales, which have been passed down to younger women, preventing them from seeking care during pregnancy, until complications set in. “In as much as we are taking time to address these myths, we want everyone to know that pregnancy is not a disease. “If only pregnant women will take it serious, attend antenatal care; follow their doctors advices, nearly 95 per cent of pregnancies will be delivered successfully without complications. However, it’s the remaining five per cent nobody knows where they are. “Unfortunately, most times, when some of these pregnant women who had initially neglected antenatal care are brought to the hospitals, it’s either the baby is dead or the mother is in a serious condition. “This is why I recommend the book “What Mama didn’t tell you about pregnancy-the myth, the truth and the lie”, for every woman, who desires to carry her pregnancy to term successfully”, he remarked. Giwa-Osagie said the book which talked about the step by step application of Ultrasonography would help doctors and women understand the peculiarity of the pregnancy and ensure safe delivery. “This book will have a very wide application as it will help many educated pregnant women. It will save lives of babies and mothers,” he said. Also speaking, Prof. Babatunde Salako, Director-General, NIMR said that the books were a veritable source of information for doctors and residents in training as it would facilitate their knowledge ability to handle pregnancies. “This means that we will produce more knowledgeable obstetricians and gynaecologists who will make correct diagnosis and take appropriate decisions on their patients to enhance delivery of the baby and safety for the mother. “When our pregnant women attend antenatal these doctors will handle their cases properly and we can also say that this development will reduce the rate of maternal and infant deaths in the country,” he said. The Book Reviewer, Dr Oliver Ezechi, Obstetrician and Gynaecologist at NIMR said that the ‘Old Wife’s Tales’ (Myth) about pregnancy passed down from generation to generation were the greatest challenge in reducing infant and maternal mortality. Ezechi said that the book debunked the myth that affected pregnancy outcomes negatively. “Pregnancy is not a disease, it is a normal physiological process and if women take it serious by registering for Antenatal early and take their doctor’s advice; close to 95 per cent of pregnancies will be successful without complications. “With Antenatal attendance, doctors will identify problems early and prevent them – prevent infant and maternal deaths,” Ezechi said. Also reviewing the book ‘ What Mama didn’t tell You about Pregnancy – the Myth, the Truth and the Lie’ , Mrs Rabi Adetoro said that the 100 pages book narrated a beautiful story of pregnancy from conception to delivery and post-delivery stages. “The book explained the time to register for antenatal, diets during pregnancy, signs, and the role of fathers to secure the health of the mother and the baby,” she said. In his remarks, Ohihoin, the Author of the books, said that rate of Antenatal care attendance in Nigeria was 51 per cent, saying that such rate was too low and a major contributor to the high rate of infant and maternal mortality. He said that the main aim of antenatal care was to ensure a healthy mother and infant at the end of the pregnancy to reduces maternal and child mortality rates. “I wrote this books to emphasise that antenatal care should be seen as a major preventive health measure aimed at preventing the development of any pregnancy disorders or complications. “Antenatal care should address the psychosocial and medical needs of the woman within the context of the health care delivery system and the culture in which she lives,” he said.